This tapestry has a celestial design with the sun and starry background. 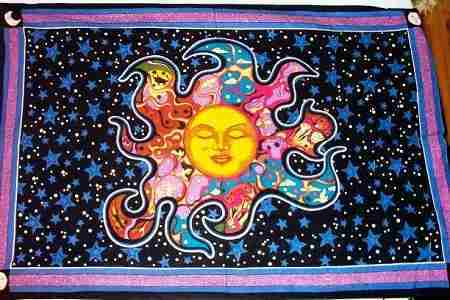 Our dreaming sun tapestry is made of 100% cotton and has loops on the side for easy hanging. You can use this tapestry as wall hanging in your home or office, throw it over a couch, or as a bedspread on a twin bed. It would look great in a dorm room and even better under a black light. I ordered this for my daughter and she was so surprised. It was on her wish list. The customer service was awesome and the tapestry is beautiful! I ordered this tapestry for my boyfriend and both of us LOVE IT. It can work in so many ways- Ifor example since it was too big for just his wall, he pinned it up to his ceiling above his bed and it's right above him. It's awesome, definitely worth the buy!!!!! I wanted to decorate my dorm room wall with something and when I bought this tapestry it was exactly what I needed. It looks exactly like the picture and its enormous. I'm so glad I bought it! Christmas present for my daughter. She loves it! We have embellished it with firefly lights around the border…she's in heaven. I love this!!! It goes perfectly well in my room. It completely personifies my room and reflects my personality. It definitely fills up an empty wall.